Identification: Narrow tail on hindwing. 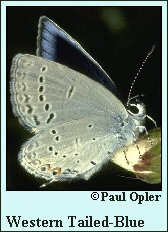 Upperside of male blue, female brown with blue at wing base. Underside white with black spots indistinct or lacking; single small orange spot near tail. Life history: Males patrol and perch during the day. Females lay eggs on flowers or young seedpods of host plant. Caterpillars eat young seeds inside the pod, where they overwinter and pupate. Flight: March-July. Several broods in southern California, a partial second brood in the southern Rocky Mountains, and one brood elsewhere. Caterpillar hosts: Legumes with inflated pods including false lupine (Thermopsis), milkvetch (Astragalus), crazyweed (Oxytropis), and vetches (Vicia and Lathyrus). Habitat: Open - usually native - areas with low shrubs including chaparral, meadows, and open woodland. Range: Alaska south through western North America and all western mountains to northern Baja California, east across Canada's prairie provinces to northern Michigan, Ontario, and the Gaspé Peninsula.